Holy Humidity Batman! I don’t even know where to start with this race! Jason Green from Yeti Trail Runners hosts a Yeti Snakebite 50/50 each year at Sweetwater State Park in Lithia Springs, Georgia. He changes it up each year usually offering 50K and 50M options thus the 50/50 and it’s held the last weekend in August. August is not known for cool fall weather in Georgia! This year he changed it up and decided a 50K all at night would be a fun, so you had a 50K or 11 miler option! This would be my 3rd year running the Snakebite 50/50. Oh and another fun little change this year would be that the looped course (3 loops) would cross a river with a promise of an awesome island Aid Station in the middle. Now how could this not be the best race of the summer! 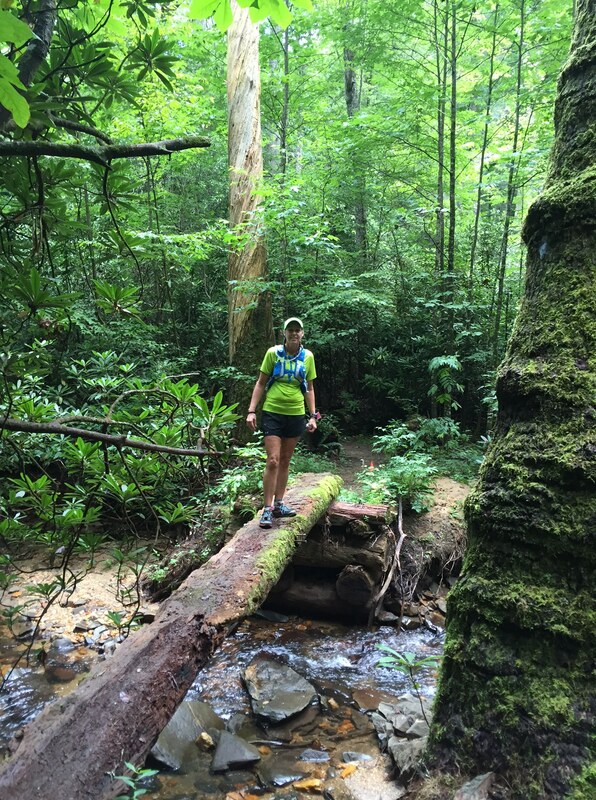 If you’ve ever run at Sweetwater State Park, which most of the local ultra runners have all done at some point, you know the trails can be technical and sometimes challenging. As with most races, we started our course with a short distanced on the paved road to a fire road that led us down to a large bridge crossing the river. I know Sweetwater Park pretty well and have run at some point on most of the trails/roads through places Jason finds for us to run. So the race really started out in very familiar territory for me. I knew the trails, I knew the climbs and felt very comfortable with his course markings. But as fate would have it, running in the heat, horrible humidity and the dark of night at Sweetwater would not be the easiest thing I’d ever done. The race had started at 7pm so it would be an hour and a half before we were forced to turn on our headlamps. I was hoping to get as much of the first loop completed before it got dark, thinking this would be very helpful in following the flagging and knowing my way during the dark night loops. The island Aid Station was everything I’d envisioned, filled with several of my favorite running friends, island music, Christmas lights and a rope to aid our crossing. A water station for refills was on the other side of the river crossing. Once across the river during the first loop I felt again comfortable I knew my way around the main trails of the park, but of course a turn onto some trails I hadn’t been on before (or didn’t recognize at night) changed that. A little extra distance getting off course and missing a turn told me that this had potential to be a long night. I came in off loop one having run it with Stephanie Johnson, Loren Starr and Tony Taylor for the most part. Stephanie was struggling with ITB issues and many of my friends and fellow runners were hanging at the Start/Finish and were dropping after the first loop. Loren was having stomach issues, my Rock Starr friend had run a 20K that morning so he’d already run his A-race for the day, I’m guessing. The volunteers were trying to get us out of the aid station, probably trying to keep as many moving as possible, so Tony agreed to run with me and we headed out for loop 2. I had grabbed some cold Coke from my cooler before we left. I really had no idea of our mileage or what time it was. I’m usually paying close attention to that during my races but I had my watch setting on “bike” mode when I first started and after changing it a few miles into the course, I just didn’t bother looking at it. Tony kept track on his and he would occasionally tell me we were doing good, but I asked him to keep the details of what that meant to himself. All I really wanted to know was we were in good shape! Well sort of. The second loop was really a mental funk for me. My stomach wasn’t great but I can’t say it was terrible, I felt tired and just sort of generally struggling to stay focused. It just seemed like a mental push. During our second loop Tony and I helped another runner who kept missing the turns. The course was marked well, but the night was very dark and it was easy to miss them if you didn’t either know exactly where they were or look up very often. The technical course kept you looking down and I was lucky enough to be familiar with where we were most of the time. After that our new friend Joey, decided he’d stick with us. When he asked us if it was ok if he tagged along I remember Tony saying that’s how we roll, no problem. Joey had drove down from another state just to run a Yeti race and we enjoyed his company for the remainder of the night. The water crossing on the second loop helped turn things around some for me. I still wasn’t feeling great but usually about half way through a course, just mentally I can get to a better place. Because that AS was so remote there was very limited water there and this time through it was all but gone. We managed to get a small amount from the bottom of one container. We were fortunate as others behind us got none. So sorry guys if we took the last of it. The humidity of the night was really tough. We got back in after our second loop and just knowing we had only 1 more loop was mentally a game changer for me. After getting more cold Coke from my cooler, we were getting ready to head out when Stephanie and Loren came in together. Loren was now really having stomach trouble and dropping, Stephanie said her knee was feeling better and wanted us to wait before we left for the final loop so she could join us. Stephanie quickly grab something to drink and a bit to eat and caught up as the AS volunteers were again trying to get us all back out on the course. Being the start and finish area it was very crowded. If you haven’t done a looped course before, sometimes it becomes more like a party there later in the race and let me tell you, the idea of heading back out for another hard loop in the dark isn’t always the most appealing prospect. I know some runner who don’t do looped races for that very reason. It’s just too easy to call it a day (or night as it might be) and quit. And if you know the Yeti Runners, it’s all about fun and beer! So hey, there’s that too! But off we went. Last loop, we got this! Our group was now 4 as we headed back out for the final time. Everyone seemed to be feeling much better and ready to finish. It’s always nice when you are on a final loop and you know it’s the last time you’ll have to do that climb or section again, and with each mile further into the loop, you’re that much closer to being done. Another friend of ours, Richard had “leap frogged” with us the entire night and shortly into our loop became the 5th runner of our little group. The power lines and the hills were tough climbs but we all found energy to run the downhill’s and flatter sections. We looked forward to the water crossing one last time and everyone really just wanted to go for a swim at that point. The water was pretty warm and not so refreshing but by the final crossing it felt a little cooler. And this time through there was water at the AS although we were all well stocked knowing they probably wouldn’t have any. A quick drink and we were up the hill and off towards the finish. We again found our energy to run the flatter sections, avoiding the roots and rocks in fear of wiping out during the final stretch, as we headed to the finish and one Big A$$ finishers medal! Yeti’s do it in style! Awesome job Jason! Yeti Trail Runners, Not a Cult! First of all you have to question anyone’s sanity to run this race. Basically you receive a list of waypoints to put into your map, a 50 mile course that in the past has been very loosely marked and best of luck to you! Over 20,000 feet of climbing starting from Vogel State Park, up the Coosa Backcountry loop and covering a lot of the DRT or Dragon Spine as the runners here call it here in Georgia. “Fun Times on the Dragon Spine” is the motto of this race. With Aid Stationed named “Lipstick and Lugnuts” and the “Fire Pit” that promises to be a slave labor camp if you drop there, you are pretty much screwed from the start. But just getting to the start is a trick in itself. 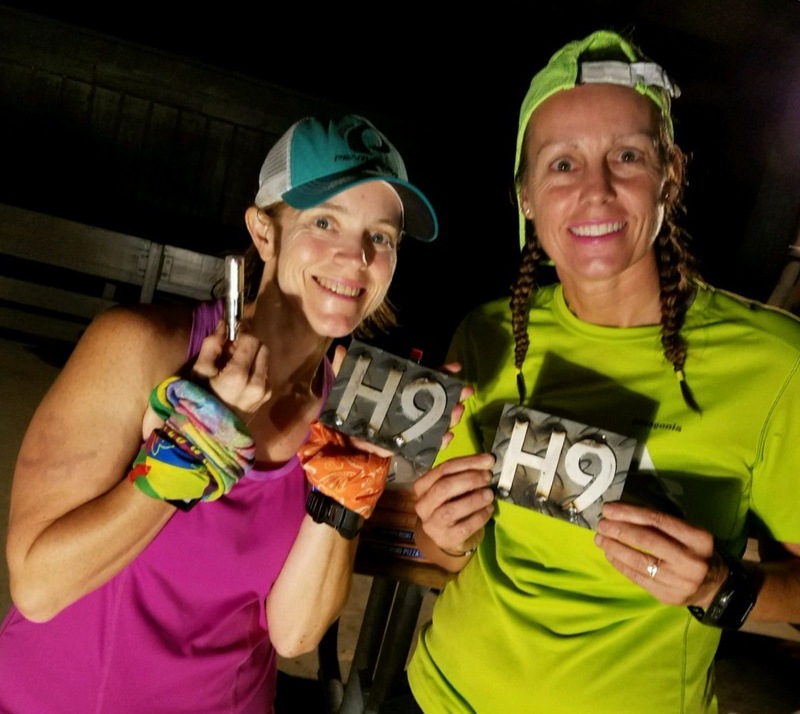 H9 race has been legendary and quit a well kept secret for years to the local trail runners of North Georgia. Only by invitation did runners even know about this exclusive club event. I was invited last year and did the Marathon having no real details of any kind. Carrie invited me, I signed up, then showed up with her having gotten the map and details from secret locations. Clearly I was not in the inner circle of information. This year you could find the club on Ultra Signup and then only after joining the club were you able to then signup for the race itself. But don’t kid yourself, that did not get you any information. The lucky ones were on the Facebook closed H9 group page (this maybe a secret in itself). This is where some limited information is found. Several weeks of pre-race chatter on this page only served to scare us poor victims who were running the race, not provide useful insight or tips. We did however get some limited race info emailed to us. Highlights included, “wear lots of body glide, humidity level will be near 100%,” “course will be marked with orange flags,” and “if the arrow points the same direction as you are moving and says VOGEL – go that way! That is likely your shortest route to the finish.” Great! We are all set! Carrie and I drove up to Vogel State Park the afternoon before the race. We were staying in a cabin close to the finish line. That night before the race there was a packet pickup, ok well pick up your shirt is about it. There was a Pre-race “sensing session (a little bit of handholding – but no real information)”. And just for the record, I did make Perry hold my hand! Saturday morning before the race start you checked in and they wrote your race number on your arm in Sharpie. Mingling with the other runners before the start of the race was more like a family reunion with around 50 of your running buddies! Right at 6:30am the RD Perry Sebastian said “go”, that was it. We were off! May the odds be ever in our favor! I’m sure my fellow H9ers could add more to this list! The race starts off with the climb up the Coosa Backcountry loop. We enjoyed a fun time climbing and chatting with everyone during this section! It didn’t take long for the sweat to start rolling off our faces and never stopped. Before reaching the top of Coosa we turned onto a small fire road towards Bull Gap and some good climbs leading to the Fire Pit. The toughest climb to the top of Coosa Bald is really from the backside coming off the DRT, so why would we not want to do this 1 mile straight up climb at least a couple of times during this race? 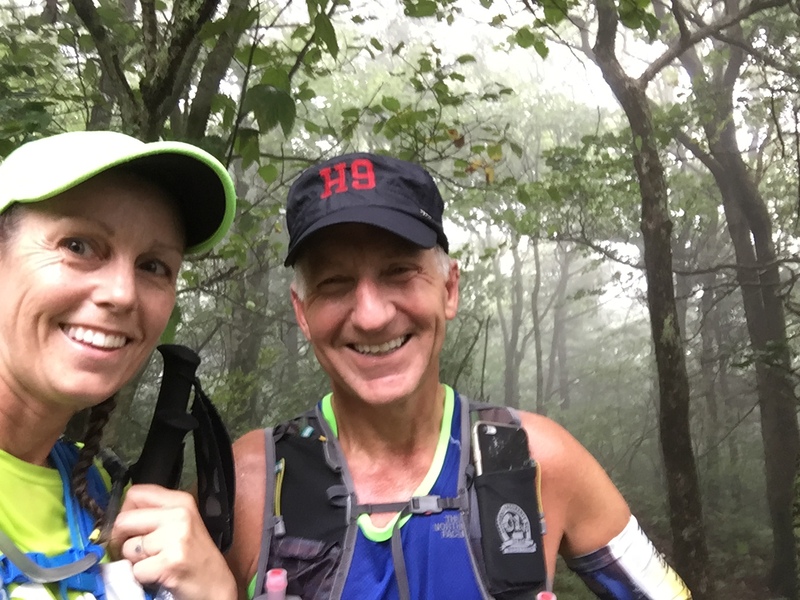 This is after all “Hard Times on the Dragon Spine!” After leaving the Fire Pit and our first AS it was up to the top of Coosa Bald and then a nice drop into Wolfpen Gap which was some of the best running section of the course. We got Coke at Wolfpen AS and were quickly off to the next section, it would be around 10 miles to the next AS at Lipstick and Lugnuts with a water drop only in the middle. These 10 miles were largely fire road sections, much of it was nice running with later roads that had heavy gravel that started to wear on my feet. After we got through Lipstick and Lugnuts, loaded up with more Coke and snacks, we were onto some of my favorite parts of the course, Yellow Mountain. This is such a beautiful section with everything covered in green moss and a creek running through it. Almost makes the climb out of there worth it. Several more miles of barely used trails and old roads and we are back to the DRT at Mulky Gap and a water stop. Three miles of climbing on the DRT and out to Fish Gap AS. The climbs on the DRT in the heat and humidity prove to be no easier than some of Perry’s “trails”. We were definitely happy to be at Fish Gap and friendly faces there but not looking too thrilled. We now had a 12 mile looped section to do that is called the “green loop”. If you weren’t broke down and beaten by this section, there would be little question that after this loop you were toast. The one thing about running on the DRT and surrounding trails is the beauty. I try to make a point of noticing the little things and stop to take in the views when I get a chance. 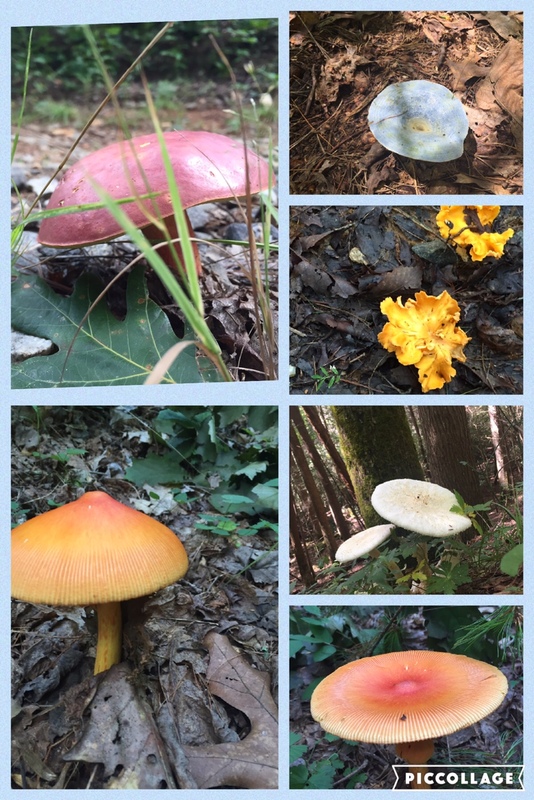 Today the course seemed to be filled with mushroom in all colors and shapes. So many seemed to be there just to add beauty to our day and this gorgeous course. 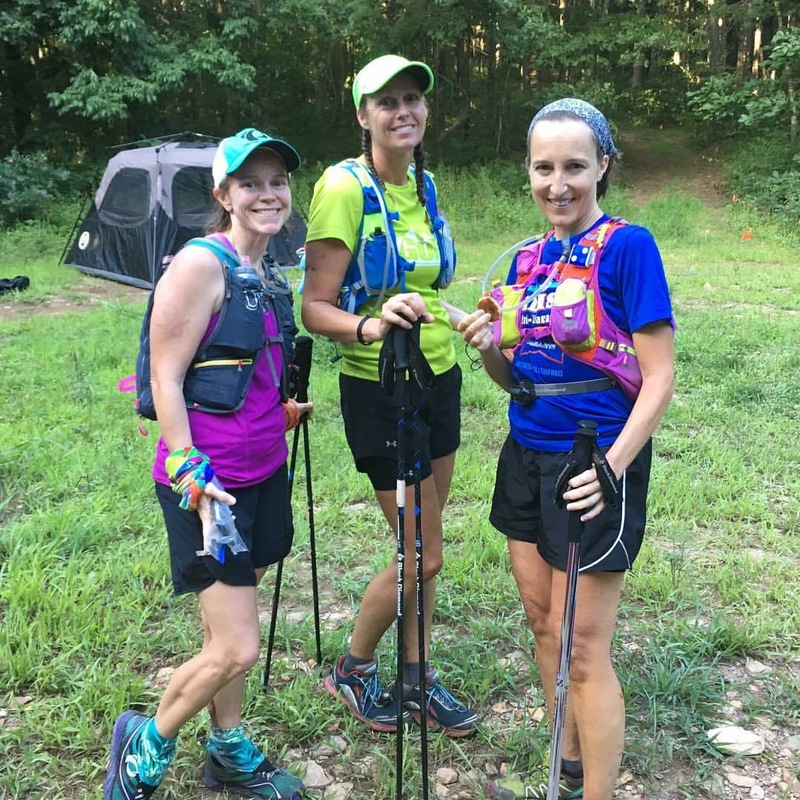 When we got to the AS out on the Green Loop, Mary Dean and her pacer for the loop, Lara had caught up to us. We all stayed together and enjoyed the rest of the loop, using that word enjoyed very loosely. We were feeling so happy to be done with the 3.5 mile loop and headed back toward Fish Gap AS, only to hit the terrible climb up the side of the mountain with no real trail, just flags to follow. Really Perry, this is the best you could do? I think his name had been used as a curse word several times during this climb and it was still echoing through the forest. Once back onto the DRT we felt like it would be smooth hiking/running to get back to Fish Gap but soon figured we were much closer to Skeenah Gap and had some monster hills left to climb just to get back to Fish Gap. It was a brutal finish to the 12 mile green loop. Now at Fish Gap with roughly 13 miles to the finish we were feeling good that we would finish ahead of cutoffs. We also knew ahead were lots of hills to climb and probably dark before we reached the Fire Pit AS. Mary Dean, Carrie and I set out together. Carrie was dealing with a little stomach issues and more back pain. The climbs were getting increasingly tougher and slower for her. We knew there were at least 4 others behind us all trying to beat the clock. We all made it to Mulky Gap and more water. Thompson was there with ice cold water and were all so happy to see his smiling face. From there it was another 2 miles of uphill to the Fire Pit. Two very long miles. It got dark shortly after we left Mulky Gap and now the hills had Carrie really struggling. Mary Dean and I eventually moved ahead to get to the Fire Pit and wait on Carrie to get in there. After getting some food and waiting about 15 minutes the AS “enablers” encouraged us to go on and not wait for Carrie. It was dark and I hated to leave her but told the workers to have her wait on the Milner’s who were somewhere behind us. We knew she could finish with them and knew that David was also struggling on the hills. So we made the decision to go and Mary Dean and I headed to climb Coosa Bald one last time. After 45 miles and close to 20,000 feet of climb on your legs already, this one is not easier the second time around. It was a struggle for both of us but with it dark this time at least we couldn’t look up and see the top! Of course you can never look up and see the top of this long climb, even in daylight! Now it was all downhill to the finish, but that didn’t prove to be easy. My feet were so sore and hurting from the climbs and then rocky fire roads that tore them up. Going down was wet, steep and slippery. Mary Dean and I both struggled and slipped several times making going down slower than we would have liked. We knew the fire road ahead to lead us into Vogel was only 1.5 miles away and we thought that would bring an easy finish. The fire road brought more heavy large gravel that was an extremely painful way to finish off 50 plus miles. We dropped into Vogel finishing out our H9 race! Mary Dean was not only given her awesome finishers award but some lipstick! I think there’s a story there but it’s not mine to tell. Mary Dean and I put on some lipstick for this picture taken with our finishers hardware! We waited for the others behind us to finish and Carrie came proudly in DFL just before the cutoff! She had always wanted to be DFL. Two of the final finishers, David and Alicia Milner received their sweet 5 year jackets for finishing the race five times. Now these people really need to have their heads examined. I know we are all crazy but this is insanity; a straight-jacket might be appropriate! LOL!! If you see me sporting an H9 jacket 5 years from now, just don’t say a word!